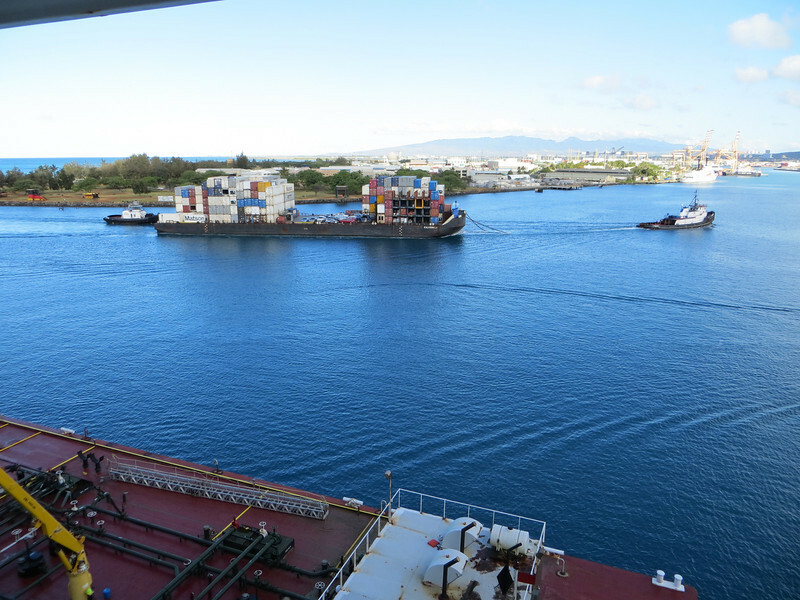 We were back in Honolulu on the morning of Saturday, April 21. We had decided to stay some extra time in Honolulu and try to see a little more of the city. So we spent the rest of Saturday and all day Sunday there, flying home on Monday, April 23. There are many interesting things to see in the city itself, as well as the rest of Oahu to explore. We had limited time and did not want to rent a car, so we picked things that we could reach by public transportation and were primarily of historic interest. I enjoyed it all but there were things I wish we could have done--for example, visiting a botanical garden to see more of the Islands' plants and flowers up close, or seeing some of the scenic areas of Oahu. Maybe next time! I watched tugboats escorting this barge.